If you like to go for long-haul rides on your skateboard rather than going to the park and doing a bunch of ollies and kickflips, then clearly, you’re a longboard enthusiast. Longboard skating values speed and distance, and the best longboards on the market will be great for commuting or just getting around. In this guide, you’ll find some longboard skate reviews so that you can find the best board for your needs. also, you can read my other post longboard vis skateboard. Design: We all like the style, right? The best longboards will always have a design aesthetic that can incorporate cool-looking graphics or shaping that will make the board look fast. The aerodynamic design can even contribute a bit of speed to your trip. When searching for the best longboard, always pick the one with a design that speaks to your sense of style. Different longboards will also have different shaping profiles; some decks will be shaped with a rounded style. And others will have a more angled design. Warehouse skateboards do a great job of summarizing the difference between the two longboard types. Deck Material: Truck and wheel material really has a big impact on your longboard experience, but the way your deck feels and performs will definitely change up your longboarding. Maple is typically the go-to material for the best longboards, but materials like bamboo and carbon fiber have devout followings. 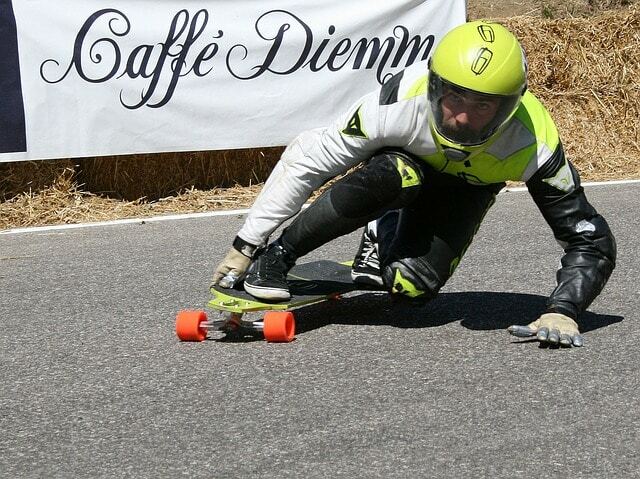 Speed: Cruiser boards are good for distance, but if you want incredible speeds like in this video then downhill boards will be best. In any situation, when purchasing a board, consider the speed that you’d like to be traveling. One of the best features about modern longboards is their ability to be used during commutes to and from work. When commuting, a good cruiser board will provide nice speed and handling. Terrain Handling: Downhill boards aren’t really designed for varied terrain, which is why this type of terrain can and will cause a wipeout. With this in mind, consider the terrain that you’ll be traveling on. Is the terrain around your intended boarding area rougher? Then, select a cruiser board that has smaller wheels that can manage the terrain more evenly. Are there a lot of paved areas? Then, you can pick a board with larger wheels that will have more overall acceleration. 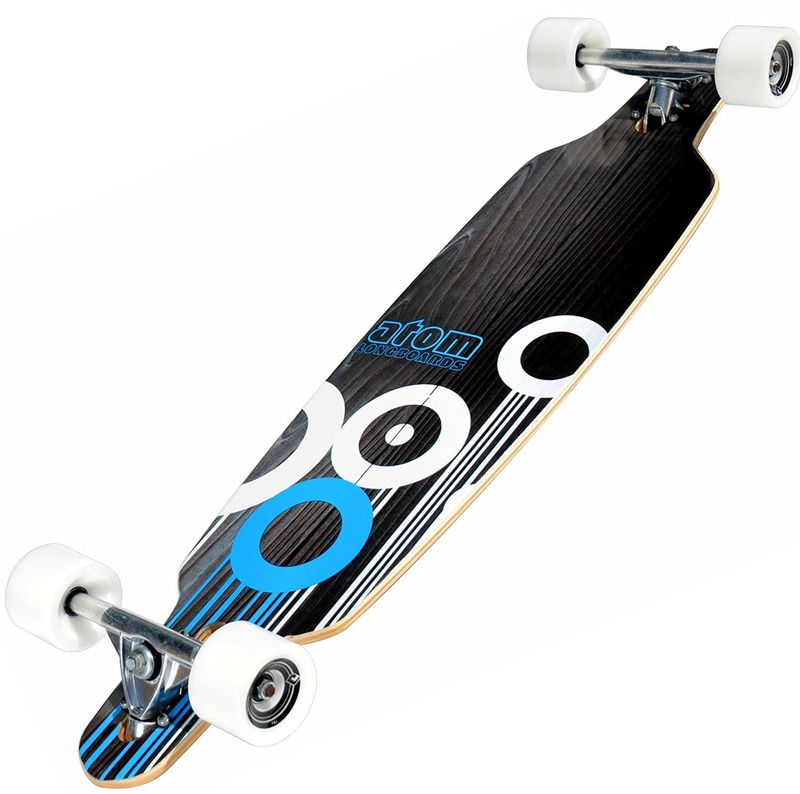 The first product in our longboard reviews is the Atom Drop-Through Longboard. This board is a downhill-style product that has a lot of built-in speed and style. From a design perspective, it comes in six unique visual aesthetics that range from Blue Woody to Red Race. The board is made one of the best materials: maple laminate. This means that you can expect it to be strong and responsive enough to provide the best riding experience. An elegant, high-quality Atom Drop Throughout the price. This board has Reverse King Pin longboard trucks. It has ABEC 5 bearings for great control. The grip tape will keep your firmly planted on the board. This is a great first board for a new rider. The truck mount must be tightened. The grip tape can separate. The deck has some weak points. 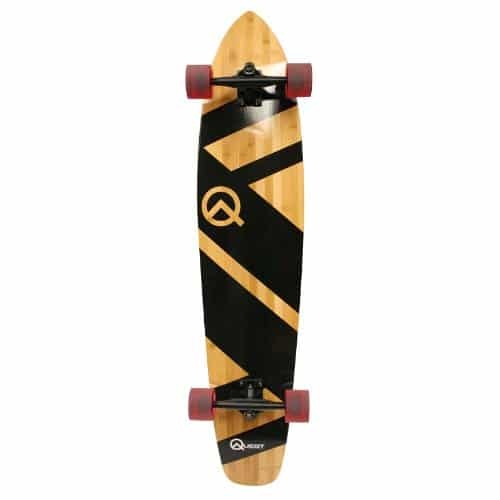 Quest Skateboards considers this board to be a “Super Cruiser” and they might just be right. This board has an ultra-lightweight bamboo and maple construction that lets it flex. This build quality really makes it a good cruiser for long-haul trips. The tracks on this are also made of aluminum, which can provide nice durability, yet doesn’t add much extra weight to the board. 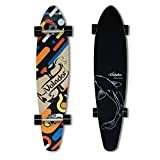 The wheels on this are also designed to provide the best possible ride smoothness, which is a major plus for those looking to commute and travel with this longboard. An elegant, high-quality Quest Super Cruiser the price. This longboard has a 44-inch design. It is made of some of the best materials. It comes in three different designs. It has wide-set wheels for the best stability and handling. It can achieve nice cruising speeds. The trucks will need to be replaced; they aren’t very good. The wheels aren’t great for uneven surfaces. 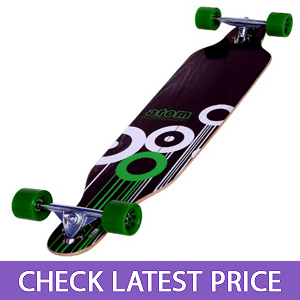 Another great downhill board, the Sector 9 Aperture Sidewinder is designed for high speeds and quick travel times. 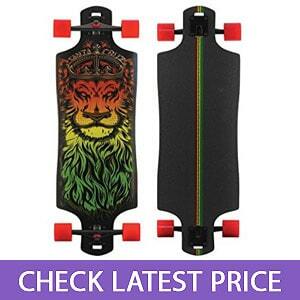 This board screams premium quality and is one of the best boards on the market for downhill longboard riding. From a design point of view, this board looks beautiful. While the other boards do have more design options, this board definitely has one of the best color designs available. 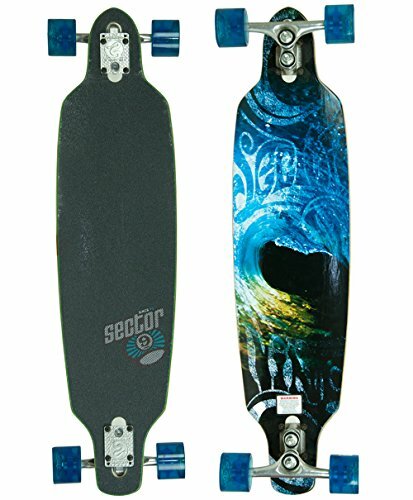 The board has a bluish wave pattern that really looks unique and will make your ride look stylish and fresh. As a drop-through longboard, the deck itself has a cutout inside of it that allows the base-plates of the board’s trucks to be attached through the deck itself. 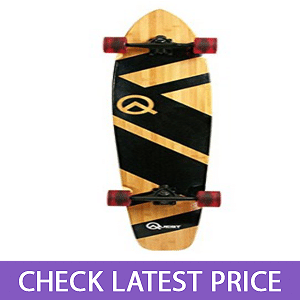 This allows the board to be lower to the ground, which provides excellent high-speed stability. An elegant, high-quality Sector 9 Aperture Sidewinder of the price. It has a great-looking design. It has a drop-through styling for speed and stability. It has ABEC 5 bearings. It is made of great materials. It isn’t the longest board at 36 inches. It doesn’t have many design options. Penny Skateboards is a classic, so you know that in this Penny longboard review, that the quality of the board will be excellent. 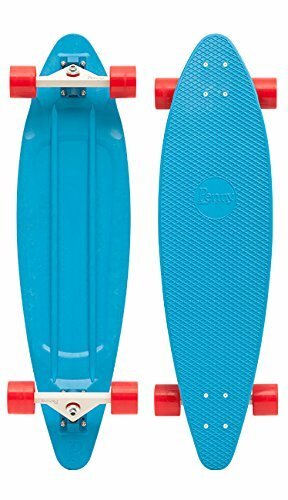 The plastic board design of this Penny board includes a textured design that really grips. While this isn’t the fastest board on the market, its pintail shaping and wide-set trucks really add some great stability and control. 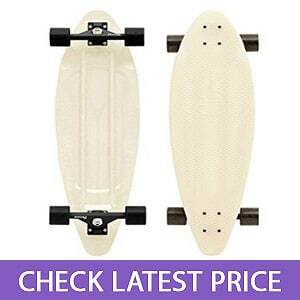 An elegant, high-quality Penny Skateboards the price. This is a relatively inexpensive board. It comes in six different colorations. The deck top grips well thanks to the waffle top design. It’s very durable and flexes well. It can feel a bit cheap because it’s made of plastic. It can get scraped up quickly. The construction of this longboard is very durable; in fact, it has a 9-ply maple construction that flexes well and can also withstand a lot of pressure. This is a drop-down longboard, which means that the platform is dropped to provide a lower center of gravity, which greatly boosts stability. 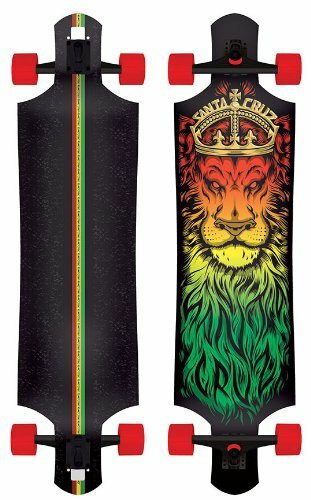 The design on this board is also unique; it features a multicolored rasta lion that has a crown that says, “Santa Cruz.” All in all, this is one of the best boards for overall performance and stability. An elegant, high-quality Santa Cruz Lion of the price. It has a very unique design with a tricolored racing stripe and rasta lion. It a good wheel width for stability. It has an easy-to-control drop-down styling. The 9-ply maple allows for larger riders. It doesn’t have a lot of design choices. The paint job can fade quickly. When you’re out there skating, these longboards will all get you where you need to go with a lot of style and speed. 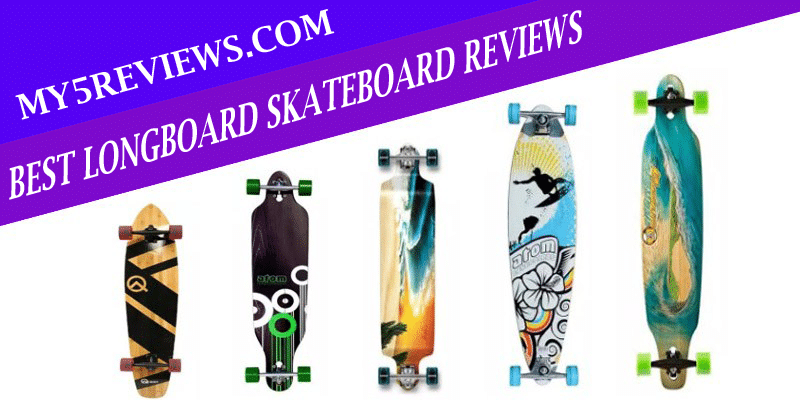 Whether you purchase one of the cruisers or the downhill models will depend on your personal preference, but each of these in our longboard skateboard reviews will provide a lot of enjoyment. If you’re not sure if a longboard is for you, check our article on how to choose the best skateboard. 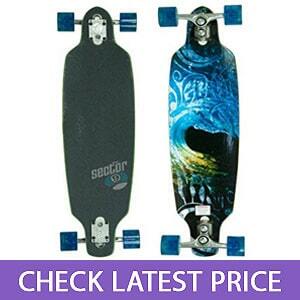 If you’re looking for another type of skateboard or are just curious, we have other skateboard articles as well.